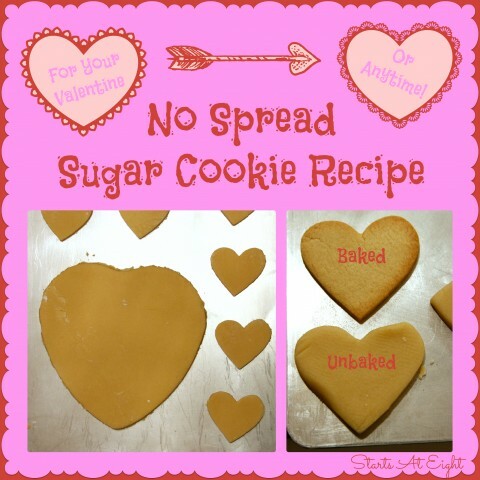 My favorite thing about this No Spread Sugar Cookie Recipe is not only that the cookies taste great, but that they actually hold their shape when baked! There is no need to worry if they will run together, or become misshapen! While we are doing these with Valentine Hearts in the photo, you can use them all year long for any cut-outs you are making. Using an electric mixer at medium-high speed, cream the butter, gradually adding the sugar. Beat in the egg & vanilla until evenly mixed. With a wooden spoon, stir in the flour. Roll the dough to a 1/4 inch thickness and cut out the cookies with your cookie cutter of choice. Bake at 375 for 8-10 minutes or until the cookies start to brown lightly around the edges.